*Would you like Wooden or Plastic Trays? With this model you could set around 145 chicken eggs, or 220 pheasant eggs every week, for continuous hatching. Once the eggs are moved to the hatcher you are able to create the best conditions for hatching, particularly the higher humidity that is so vital at this stage. The remaining eggs in the incubator can then still be brooded with lower humidity until they also are ready for the final 3 or 4 days of hatching and are transferred into the hatcher. The incubator is completely equipped with all the accessories that are needed. 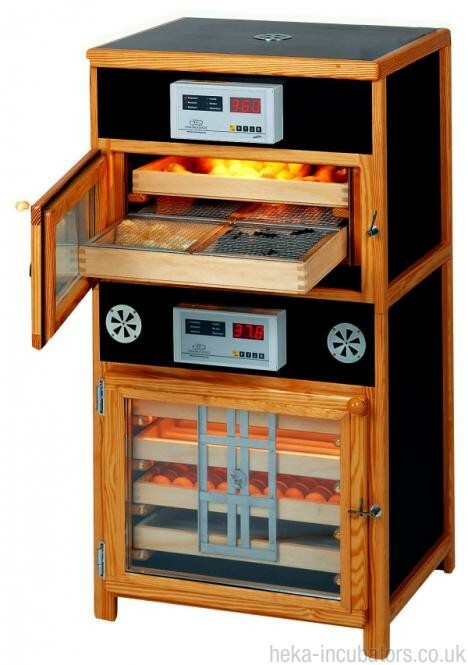 Included is an interior light, four egg trays of your choice for the lower incubation compartment, and two uncovered hatching baskets for the upper hatcher, a detailed manual and different connectors for turning any quantity of trays in the incubation compartment.